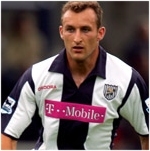 The 30 year West Brom utility player will complete a permanent transfer on Sunday. His medical was not completed in time to make his eligable for tomorrow's game on a permanent transfer so the clubs have ageed to the emergency loan to allow him to play. He can then complete the deal on Sunday. Excellent news, well done Dave Jones and welcome to Riccardo Scimeca.